It's getting disturbing out there in retail land as many big names continue to struggle with the shift to online shopping. 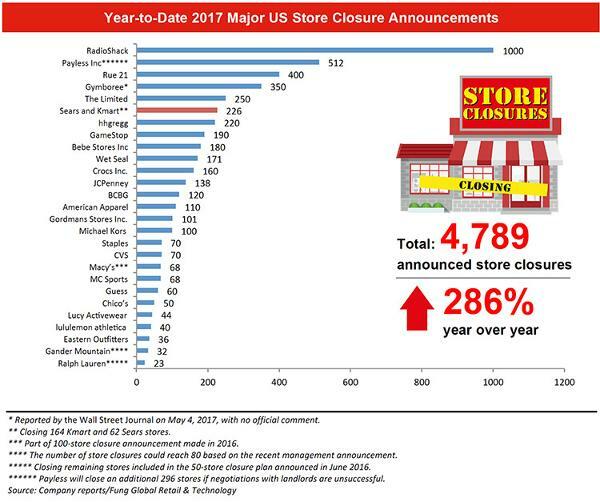 So far this year, there has been 4,789 store closure announcements, a 286% surge from a year ago, according to new data from Fung Global Retail & Technology. The list of store closures are a whose who of struggling retailers, ranging from the now defunct RadioShack to the perpetual store pruner in GameStop (GME - Get Report) . More recently, dying department store Sears Holdings Corp. (SHLD said it will close another 66 stores in a bid to cut costs and try to stay in business a little longer. These stores are in addition to the 160 Sears and Kmart locations revealed earlier in the year that the company said it would close. With children's apparel retailer Gymboree filing for bankruptcy protection on Monday, and retailers such as J.C. Penney (JCP - Get Report) searching for more ways to slash expenses, store closing data is unlikely to get better anytime soon.